When a person begins reading the Bible, it will not take long until he or she comes across statements such as “God said...,” “thus says the Lord,” or these are “the words of the Lord....” These kinds of statements appear hundreds of times in both the Old and New Testaments. In fact, the Decalogue itself begins with the phrase, “And God spoke all these words” (Exodus 20:1). Thirty-three times in the book of Leviticus, we read the words, “the Lord spoke to Moses” (4:1; 5:14; etc.). In just Psalm 119 alone, the Scriptures are exalted as the Word of God some 175 times. In the New Testament, the apostle Paul claimed that his message was not received from man, but “came through the revelation of Jesus Christ” (Galatians 1:12). Similarly, as he wrote to the church at Thessalonica, he claimed that what he wrote was “the word of the Lord” (1 Thessalonians 4:15). Truly, the writers of both the Old and New Testaments placed great emphasis on the fact that their message was of divine origin—that they spoke, not by the will of man, but “by the Holy Spirit” (2 Peter 1:21). Not only does the Bible claim to be inspired, but it also defines and describes what it means by inspiration. In 2 Timothy 3:16, Paul claimed, “All scripture is given by inspiration of God.” The Greek term underlying the word “inspiration” (theopneustos) means “God-breathed.” Thus, Paul affirmed that Scripture is the product of the breath of God. God actually breathed out the Scriptures. The Bible is God’s Word—not man’s. Three verses later (in 2 Timothy 4:2), Paul declared, “Therefore...preach the word.” Why? Because it is God’s Word. Just as surely as God’s breath brought the Universe into existence (Psalm 33:6), so the Bible declares itself to be the result of God’s out-breathing. In his second epistle (1:16-21), Peter alluded to the momentous occasion of the transfiguration of Christ—when God literally spoke from heaven directly to Peter, James, and John. God had orally boomed forth His insistence that Jesus is His beloved Son, and that human beings are commanded to hear Him (Matthew 17:5). Peter then declared: “And so we have the prophetic word confirmed,...knowing this first, that no prophecy of the Scripture is of any private interpretation.” Peter was saying that the Scriptures provided to us by the prophets are just as certain and just as authoritative as the voice of God that spoke on the mount of transfiguration. The apostle further explained that the Scriptures (the prophetic word) were not of “any private interpretation,” meaning that they did not originate on their own, or in the minds of those who wrote them. Scripture did not come from “the will of man.” It is not the end result of human research or human investigation into the nature of things. Scripture is not the product of its writers’ own thinking. On the contrary, “holy men of God spoke as they were moved by the Holy Spirit” (2 Peter 1:21). The word “moved” in the original Greek means “borne” or “brought.” Peter stated that the Holy Spirit, in essence, picked up the writers (the prophets) and “brought” them to the goal of His choosing. Thus, the Scriptures, although written by means of human instrumentality, were so superintended by God that the resulting words are His. This is the same Peter who, in 1 Peter 1:10-12, explained: (1) that the Old Testament inspired spokesmen did not always understand all the information given by God through them; (2) it was the Spirit of Christ that was operating upon them; (3) this same inspired information was being presented in Peter’s day by the apostles; and (4) the same Holy Spirit was directing their utterances. That means that inspired men had their own minds engaged as they produced inspired material, but the product was God’s, since they did not always grasp the significance of their productions. This is the same Peter who, in 2 Peter 3:15-16, referred to “our beloved brother Paul” as having “written to you.” He then noted: “as also in all his epistles, speaking in them of these things; in which are some things hard to be understood, which untaught and unstable people twist to their own destruction, as they do also the rest of the Scriptures.” Notice that Peter made clear that: (1) Paul wrote epistles; (2) those epistles are classified with “the rest of Scriptures”—so Paul’s letters are Scripture every bit as much as the Old Testament and other New Testament writings; and (3) these writings are authoritative and divine, since Peter said that to twist them is to invite “destruction”—an obvious reference to God’s disfavor, and the spiritual harm that results from disobeying God’s words. The Bible unquestionably claims for itself the status of “inspiration”—having been breathed by the Almighty Himself. That inspiration entails such superintendence by God that even the words themselves have come under His divine influence. King David once stated: “The Spirit of the Lord spoke by me, and His word was on my tongue” (2 Samuel 23:2). Observe that David did not say God’s “thoughts” or “concepts” were on his tongue, but that Jehovah’s word was on his tongue. In 1 Corinthians 2, the apostle Paul declared that the things of God were revealed to men by God’s Spirit. Then, concerning the divinely inspired messages, he went on to state, “which things we speak, not in words which man’s wisdom teacheth, but which the Spirit teacheth; combining spiritual things with spiritual words” (1 Corinthians 2:13, ASV, emp. added; cf. John 17:8). The words of divine revelation are Spirit-directed words, not words of mere human wisdom. This is verbal inspiration. This does not mean that the writers merely took “dictation.” Rather, the Bible indicates that God adapted His inspiring activity to the individual temperament, vocabulary, and stylistic idiosyncrasies of each writer. More Americans are moving toward an interpretation of the Bible as a book of fables, history, and moral precepts. ...Attempts at demythologizing the Bible that have been ongoing in the academy for years seem to be moving more and more from the classroom to the pews.... As recently as 1963, two persons in three viewed the Bible as the actual word of God, to be taken literally, word for word. Today, only one person in three still holds to that interpretation (1999, p. 36). Certainly, for years skeptics have been hard at work in their attempts to undermine one of the foundational pillars of the Christian’s faith—the Bible being the inerrant, inspired Word of God. As damaging as their doctrine is, however, perhaps a more damaging message of biblical errancy can be heard from a number of people who claim to be Christians. Since the rise of liberal “scholarship” in the eighteenth century, ruthless attacks have been leveled from within Christendom on the integrity of the Bible. The Mosaic authorship of the Pentateuch, the historicity of the book of Jonah, and even the miracles of Christ are just a sampling of the Bible topics that liberal scholars have been attacking relentlessly in the past three centuries. Names such as Karl Graf, Julius Wellhausen, and Rudolf Bultmann are frequently cited in scholastic settings where the integrity of the Bible is challenged. In the late twentieth century, writer George Marsden, in his book titled Reforming Fundamentalism (1987), documented how one of the most popular theological seminaries in America (Fuller Seminary) had dropped its commitment to the inerrancy of Scripture as early as the 1960s. Sadly, this trend has had a snowball effect throughout America, so that increasingly, more schools of theology, even ones of a much more conservative background than Fuller Theological Seminary, are rejecting the belief that the Bible is accurate in all that it teaches. In 2002, the ACU Press published a book titled God’s Holy Fire, written by three professors from the Graduate School of Theology at Abilene Christian University. Taking issue with the usefulness and/or appropriateness of the term “inerrancy,” Kenneth Cukrowski, Mark Hamilton, and James Thompson asked if “inerrancy even applies to minor narrative details?” (p. 40). According to these men, “[I]n numerous instances in the Bible, one finds apparent inconsistencies in the narratives” (p. 40). Examples they gave included: (1) the raising of Jairus’ daughter; (2) Jesus’ cursing of the fig tree; (3) the cleansing of the temple; and (4) Matthew’s quotation of Jeremiah in 27:9. Following these alleged internal inconsistencies, they then stated: “Sometimes the narrative does not correspond to the historical record” (p. 40). Although Cukrowski, Hamilton, and Thompson admitted that “more information might actually resolve many of these difficulties” (p. 41), they later observed: “Because the Bible has come to us through human beings, our view of the divine origin of Scripture is not a matter of mathematical certainty, but ultimately an affirmation of faith” (p. 45). Finally, these men described, not skeptics, but “well-meaning Christians” who hold to Scripture as being the truthful Word of God in all that it says, as those who “in their attempts to provide absolute certainty,...have created a crisis of faith,” because they are “always feeling a responsibility to provide an answer for every potential discrepancy” (p. 44). According to these writers, Christians merely “assume that God ensured the precise accuracy of the original versions” (p. 42, emp. added). It is possible that Paul, citing the Old Testament from memory as he wrote to the Corinthians, referred to the incident in Numbers 25:9, but his mind slipped a chapter later in picking up the number.... We cannot rule out the possibility that there was some reference to 23 or 23,000 in his local environment as he was writing, and that caused a slip in his mind. Paul was not attempting to instruct people on Old Testament history, and certainly not on the details of Old Testament history. Thus, here we have a case in which Paul apparently makes a slip of the mind for some reason (unless he has special revelation he does not inform us about), but the mental error does not affect the teaching. How often have we heard preachers with written Bibles before them make similar errors of details that in no way affected their message? If we notice it (and few usually do), we (hopefully) simply smile and focus on the real point being made. As noted above, Paul probably did not have a written Bible to check (although at times he apparently had access to scrolls of the Old Testament), but in the full swing of dictation he cited an example from memory and got a detail wrong (pp. 598-599, parenthetical comments in orig., emp. added). Unbelievable! Walter Kaiser, Peter Davids, Manfred Brauch, and F.F. Bruce pen an 800-page book in an attempt to answer numerous alleged Bible contradictions and to defend the integrity of the Bible, and yet Davids has the audacity to suggest that the apostle Paul “cited an example from memory and got a detail wrong.” Why in the world did Davids spend so much time (and space) answering various questions that skeptics frequently raise, and then conclude that the man who penned almost half of the New Testament books made mistakes in his writings?! He has concluded exactly what the infidels teach—Bible writers made mistakes! Furthermore, if Paul made one mistake in his writings, he easily could have blundered elsewhere. And if Paul made mistakes in other writings, how can we say that Peter, John, Isaiah, and others did not “slip up” occasionally? In fact, why not just explain all alleged discrepancies as the result of a momentary slip of the writer’s mind? Sadly, Peter Davids totally dismisses the numerous places where Paul claims his writings are from God. When Paul wrote to the churches of Galatia, he told them that his teachings came to him “through revelation of Jesus Christ” (1:12). In his first letter to the Thessalonian Christians, he claimed the words he wrote were “by the word of the Lord” (4:15). To the church at Ephesus, Paul wrote that God’s message was “revealed by the Spirit to His holy apostles and prophets” (3:5). And in the same epistle where Davids claims that Paul “made a slip of the mind,” Paul said, “the things which I write to you are the commandments of the Lord” (1 Corinthians 14:37). Paul did not invent facts about Old Testament stories. Neither did he have to rely on his own fallible memory to recall particular numbers or names. His writings were inspired Scripture (2 Peter 3:16). The Holy Spirit revealed the Truth to him—all of it (cf. John 14:26; John 16:13). Just like the writers of the Old Testament, Paul was fully inspired by the Holy Spirit (cf. 2 Samuel 23:2; Acts 1:16; 2 Peter 1:20-21; 3:15-16; 2 Timothy 3:16-17). What liberal theologians do not tell their readers is that the Bible itself provides compelling evidence about the nature of its inspiration. Perhaps of most significance is the fact that neither Jesus nor any Bible writer ever called into question a single passage of Scripture. Jesus and the writers of Scripture believed in the truthfulness and historical reliability of even the most disputed parts of the Old Testament. Notice a few examples. While speaking to the Pharisees in the region of Judea beyond the Jordan, Jesus confirmed His belief in the real existence of an original couple created during the Creation week (Matthew 19:4; cf. Genesis 2:24). In writing to the church at Corinth, Paul affirmed his belief in Adam as the first human (1 Corinthians 15:45). Then, in his first letter to Timothy, he attested to the fact that Eve was created after Adam (2:13; cf. Genesis 2:7,21-25). Paul regarded the serpent’s deception of Eve as a historical event (2 Corinthians 11:3; 1 Timothy 2:13-14; cf. Genesis 3). Both Jesus and the apostle Peter believed that Noah was a real person, and that the global Flood was a historical event (Matthew 24:37-39; 2 Peter 2:5; 3:6; cf. Genesis 6-8). Jesus and Peter also affirmed their belief in the historicity of Lot, and in the destruction of Sodom (Luke 17:28-32; 2 Peter 2:6-7; cf. Genesis 19). Paul attested to the Israelites’ crossing of the Red Sea, and affirmed his belief in their drinking water from a rock (1 Corinthians 10:1-4; cf. Hebrews 11:29; cf. Exodus 14), while Jesus confirmed His belief in the miraculous healing of the Israelites who fixed their eyes on the bronze snake set up by Moses in the desert (John 3:14; cf. Numbers 21:4-9). Finally, unlike many people today, including some of those who claim to believe the Bible to be the inspired Word of God, Jesus regarded the account of Jonah’s three days and nights in the belly of a great fish as a historical event (Matthew 12:39-40). Numerous other examples such as these exist, and demonstrate the trustworthiness of Scripture. The Old Testament writers who came after Moses expressed total trust in the Pentateuch, as well as in each others’ writings. Furthermore, Jesus and the New Testament writers always viewed statements by each other and the Old Testament writers as being truthful, regardless of the subject matter. Although today it is not at all unusual for one religious writer to take issue with another, even when they share the same religious views or are members of the same religious group, Bible writers never criticized each others’ writings—even when one might have expected them to do so. For example, Paul rebuked Peter publicly for his unacceptable dissimulation (Galatians 2:11ff.). Yet Peter never avenged himself by denigrating Paul’s writings. In fact, as observed earlier, Peter stated that Paul’s writings were as authoritative as “the other Scriptures” (2 Peter 3:15-16). Additionally, in defending the right of elders to receive remuneration from the church treasury for their work, Paul quoted Deuteronomy 25:4 and Luke 10:7, and classified both as “Scripture” (1 Timothy 5:18). It is clear that the Bible writers always considered each others’ works to be truthful. How can anyone who claims to be a Christian hold to the viewpoint that the Scriptures contain errors? Jesus and the Bible writers always acknowledged that God ensured the precise accuracy of the original versions (cf. Cukrowski, et al., 2002, p. 42). Why should we do any differently? The “jot” (yod) was the smallest Hebrew letter, and the “tittle” was the tiny stroke on certain Hebrew letters. It is equivalent to saying that even the dotting of “i”s and crossing of “t”s will stand. When Jesus employed these specific terms as examples, He affirmed the minutest accuracy for the Old Testament. In John 10:34-35, Jesus involved Himself in an interchange with some Jews who accused Him of blasphemy. He repelled the charge by quoting Psalm 82:6, referring to the passage as “law.” Jesus could refer to a psalm as “law” in the sense that the psalms are part of Scripture. Jesus was thus ascribing legal authority to the entire corpus of Scripture. He did the same thing in John 15:25. Likewise, the apostle Paul quoted from Psalms, Isaiah, and Genesis, and referred to each as “the Law” (1 Corinthians 14:21; Romans 3:19; Galatians 4:21). After Jesus quoted from the psalm and referred to it as “law,” He added, “and the Scripture cannot be broken.” What an incredible declaration! Notice that Christ equated “law” with “Scripture”—using the terms as synonyms. When He declared that “law,” or “Scripture,” “cannot be broken,” He was making the point that it is impossible for Scripture to be annulled, for its authority to be denied, or its truth to be withstood (see Warfield, 1970, pp. 138-140). “It cannot be emptied of its force by being shown to be erroneous” (Morris, 1995, p. 468). Jesus quoted a relatively obscure passage of the Old Testament, and declared it to be authoritative, because “the Scripture cannot be broken.” His Jewish listeners understood this fact. If they were of the mindset that many liberals are today, they might have brushed this passage aside, saying that the psalmist made a mistake, or that this section of Scripture contained errors. They might have responded by asking Jesus, “How do you know this portion of Scripture is true, if others are not true?” Notice, however, that this was not their response. Both Jesus and His audience understood that the psalm from which He quoted was true—because it is a part of Scripture! Truly, Jesus considered every part of Scripture, even its most “casual” phrases, to be the authoritative Word of God. Once, when Jesus challenged the Pharisees to clarify the identity of the Messiah (Matthew 22:41-45), He focused on David’s use of the single term “Lord” in Psalm 110:1. He questioned the Pharisees, saying, “If David then calls Him ‘Lord,’ how is He his Son?” (Matthew 22:45). Jesus’ whole point depended on verbal inspiration. After Jesus’ resurrection, Luke recorded how Jesus appeared to two men on the road to Emmaus who were saddened and somewhat perplexed by the recent crucifixion of the One Whom they were hoping “was going to redeem Israel” (Luke 24:21). With their eyes being restrained “so that they did not know Him” (24:16), they rehearsed to Jesus what had transpired over the past few days regarding His death, His burial, and the empty tomb. The text indicates that Jesus then rebuked these two men, saying, “O foolish ones, and slow of heart to believe in all that the prophets have spoken! Ought not the Christ to have suffered these things and to enter into His glory?” (24:25-26, emp. added). Notice that Jesus did not chastise them for being slow to believe in some of what the prophets spoke, but for neglecting to believe in all that they said about the Christ. For this reason, Jesus began “at Moses and all the Prophets,” and “expounded to them in all the Scriptures the things concerning Himself ” (24:27). No wonder Jesus would rebuke His religious challengers with such phrases as: “Have you not read even this Scripture?” (Mark 12:10; cf. Matthew 21:42); “You do err, not knowing the Scriptures” (Matthew 22:29); “if you had known what this means” (Matthew 12:7); or “Go and learn what this means” (Mark 9:13). The underlying thought in such statements is that God’s truth is found in Scripture, and if you are ignorant of the Scriptures, you are susceptible to error. Similarly, on another occasion while being tested by a group of Jews regarding whether or not He actually had seen their “father” Abraham, Jesus responded by saying, “Most assuredly, I say to you, before Abraham was, I am” (John 8:58, emp. added). Just as in the case where God wanted Moses to impress upon Egypt His eternal nature, calling Himself “I am who I am” (Exodus 3:14), Christ sought to impress upon the first-century Jews His eternality. Jesus is not a “was” or a “will be”—He is...“from everlasting to everlasting” (Psalm 90:2). Once again, He based His entire argument on the tense of the verb. The same kind of reliance on a single word was expressed by Paul (as he referred to Genesis 22:18) in Galatians 3:16: “Now to Abraham and his Seed were the promises made. He does not say, ‘And to seeds,’ as of many, but as of one, ‘And to your Seed,’ who is Christ” (emp. added). The force of his argument rested on the number of the noun (singular, as opposed to plural). In light of the fact that Jesus and the Bible writers viewed the words of Scripture as being inspired (and thus truthful), even down to the very tense of a verb and number of a noun, so should all Christians. Truly, as the psalmist of long ago wrote: “The sum of thy word is truth; and every one of thy righteous ordinances endureth for ever” (Psalm 119:160, ASV, emp. added). Or, as the passage is translated in the NKJV: “The entirety of Your word is truth.” It is all true, and it is all from God. It is accurate in all its parts. The whole of the Bible is of divine origin, and therefore is reliable and trustworthy. Yes, God used human beings to write the Bible, and in so doing, allowed them to leave their imprint upon it (e.g., type of language used, fears expressed, prayers offered, interests, educational influences, etc.). But, they wrote without making any of the usual mistakes that human writers are prone to make under normal circumstances. God made certain that the words produced by the human writers He inspired were free from the errors and mistakes characteristic of uninspired writers. In reality, hundreds of Bible passages encourage God’s people to trust the Scriptures completely, but no text encourages any doubt of, or even slight mistrust in, Scripture. To rely on the inerrancy of every historical detail affirmed in Scripture is to follow the teaching and practice of the biblical authors themselves. Time and time again, Jesus and the Bible writers affirmed that God is the author of Scripture. Notice in Matthew 19:4-6 how Jesus assigned the words of Genesis 2:24 to God as the Author. He asked the Pharisees who came testing him, “Have you not read that He who made them at the beginning ‘made them male and female,’ and said, ‘For this reason a man shall leave his father and mother and be joined to his wife, and the two shall become one flesh?’ ” (emp. added). Interestingly, in Genesis 2:24, no indication is provided that God was the speaker. Rather, the words are simply a narrational comment written by the human author Moses. By Jesus attributing the actual words to God, He made it clear that all of Scripture is authored by God (cf. 2 Timothy 3:16). When writing to the Christians in Corinth, Paul treated the matter in the same way (1 Corinthians 6:16). On numerous occasions in Scripture, God is said to say certain things that are, in their original setting, merely the words of Scripture. For example, Hebrews 3:7 reads, “Wherefore, even as the Holy Spirit says...,” and then Psalm 95:7 is quoted. In Acts 4:25, God is said to have spoken by the Holy Spirit through the mouth of David the words of Psalm 2:1. In Acts 13:34, God is represented as having stated the words of Isaiah 55:3 and Psalm 16:10. In each of these cases, the words attributed to God are not specifically His words in their original setting, but merely the words of Scripture itself. The writers of the New Testament sometimes referred to the Scriptures as if they were God (cf. Romans 9:17; Galatians 3:8), and they sometimes referred to God as if He were Scripture. 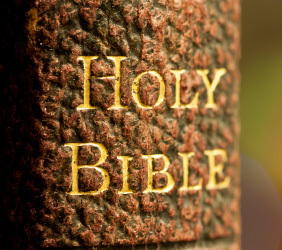 The Bible thus presents itself as the very words of God. In Hebrews 1:5-13, the writer quoted from Psalm 2:7, 2 Samuel 7:14, Deuteronomy 32:43, Psalm 104:4, Psalm 45:6-7, Psalm 102:25-27, and Psalm 110:1. The Hebrews writer attributed each of these passages to God as the speaker. Yet in their original setting in the Old Testament, sometimes God is the speaker, while sometimes He is not, and is, in fact, being spoken to or spoken about. Why would the writer of Hebrews indiscriminately assign all of these passages to God? Because they all have in common the fact that they are the words of Scripture and, as such, are the words of God. Thus, every word of the Bible is the Word of God! And, as Jesus prayed on the night of His betrayal, God’s “word is truth” (John 17: 17). From beginning to end, the Bible reveals that the infinite, eternal Being Who created everything and everyone that exists in the Universe (other than Himself), is truthful. His “Spirit is truth” (1 John 5:6), His “words are true” (2 Samuel 7:28), His “law is truth” (Psalm 119:14), His “commandments are truth” (Psalm 119:151), His “judgments...are true” (Psalm 19:9), and His “works are truth” (Daniel 4:37). He literally embodies truth. When the Son of God was on Earth, He claimed to be truth (John 14:6). There is nothing false about God. When Paul wrote to Titus, he described God as the One “who cannot lie” (1:2). Similarly, the writer of Hebrews declared that “it is impossible for God to lie” (6:18). If God is perfect, and if the Bible is the Word of God (which it claims to be, as the previous sections demonstrate), then it follows that, in its original form as it initially came from God, the Bible must be perfect. The Scriptures cannot err if they are “borne” of God. Try as one might, logically, one cannot have it both ways. The Bible is either from God (and thus flawless in its original autographs), or it contains mistakes, and therefore did not come from the God of truth. There is no middle ground. Some argue: “But the Bible was written down by humans. And ‘to err is human.’ Thus, the Bible could not have been perfect from the beginning.” Consider the fallacy of such reasoning. If a person concludes that all humans err—regardless of the circumstances—then Jesus must have sinned. (1) Jesus was a human being (Galatians 4:4). (2) Human beings sin (Isaiah 53:6). (3) Therefore, Jesus sinned. But most any Bible student knows that Jesus did not sin. The New Testament declares that He was “pure” and “righteous” (1 John 3:3; 2:1), and “committed no sin, nor was deceit found in His mouth” (1 Peter 2:22). He was “a lamb without blemish and without spot” (1 Peter 1:19), “Who knew no sin” (2 Corinthians 5:21). Since we know that Jesus did not sin, something must be wrong with the above argument. But what is it? The mistake is to assume that Jesus is like any other human. Sure, mere human beings sin. But, Jesus was not a mere human being. He was a perfect human being. Indeed, Jesus was not only human, but He was also God. Likewise, the Bible is not a mere human book. It is also the Word of God. Like Jesus, it is both divine and human. And just as Jesus was human but did not sin, even so the Bible is a human book but does not err. Both God’s living Word (Christ) and His written Word (Scripture) are human but do not err. They are divine and cannot err. There can no more be an error in God’s written Word than there was a sin in God’s living Word. God cannot err, period (Geisler and Howe, 1992, pp. 14-15, emp. in orig.). Admittedly, it is normal to make blunders. (In fact, this very article is likely to have one or more mistakes in it.) But, the conditions under which the Bible writers wrote was anything but normal. They were moved and guided into all truth by God’s Spirit (John 16:13; 2 Peter 1:21). Sadly, it is not uncommon to hear liberal theologians, and those who are sympathetic with them, suggest that the “spiritual” parts of Scripture are inspired, but that the portions dealing with matters of history, geography, astronomy, medicine, and the like, are not. This concept, known as the doctrine of “partial inspiration,” is faulty for at least three reasons. First, there are no statements in Scripture that lead a person to believe this manner of interpreting the Bible is acceptable. Conversely, as already indicated, both Jesus and the Bible writers always worked from the premise that God’s Word is entirely true (Psalm 119:160), not partially true. Second, were it true that only the “spiritual” sections of the Bible are inerrant, everyone who reads the text would have the personal responsibility of wading through the biblical documents to decide exactly which matters are “spiritual” (thus, inspired) and which are not (thus, uninspired). Such an interpretation of Scripture, however, makes a mockery of biblical authority. The Bible can be authoritative if, and only if, it is truly and verifiably the Word of God. That his word has been passed through men does not negate its authority so long as he has so controlled them as to guard them from all error. If his control over the biblical writers was not total, we can never be sure where the writer was accurate (thus believable) and where he was mistaken (thus worthy of rejection). In such a case, the Bible would be authoritative only when we declared it to be so. Then the circle has come full, and man is authoritative over the Bible rather than submitting to its direction (Shelly, 1990, p. 152, parenthetical items in orig.). If Christians abandon the doctrine of biblical inerrancy, then having a standard of truth by which all humans are to live their lives would be impossible. Like the son who obeys his father insofar as he agrees with the father’s rules, a Christian would have his own standard of authority because the Bible would be authoritative only when he judged it to be a reliable guide. Simply put, Scripture cannot be demonstrated to be divinely authoritative if the Bible (again, in its original autographs) contained factual errors. Finally, if a Christian believes that the Bible is fallible, then one is forced to accept the inevitable conclusion that, on some occasions, God “breathed” truth, while on others He “breathed” error (cf. 2 Timothy 3:16). If all of Scripture is indicated as being from God—even narrational comments and statements from unbelievers—then an attack upon the trustworthiness of any passage is an attack upon Almighty God. If God can inspire a man to write theological and doctrinal truth, He simultaneously can inspire the same man to write with historical and scientific precision. If the Bible is not reliable and trustworthy in its allusion to “peripheral” matters, how can it be relied upon to be truthful and accurate in more central matters? Is an omnipotent God incapable of preserving human writers from making false statements in their recording of His words? It will not do to point out that the Bible was not intended to be a textbook of science or history. If, in the process of pressing His spiritual agenda, God alluded to geography, cosmology, or medicine, God did not lie. Nor would He allow an inspired person to speak falsely. The question must be asked: If God cannot handle correctly “trivial” matters (such as geographical directions, or the name of an individual), why would anyone think that they could trust Him with something as critically important as the safety of their eternal soul, and expect Him to handle it in a more appropriate fashion? Or, looking at this matter from another angle, consider the question Jesus asked Nicodemus: “If I have told you earthly things and you do not believe, how will you believe if I tell you heavenly things” (John 3:12)? Implied in this statement is the fact that had Jesus told Nicodemus earthly things, they would have been true. The same reasoning follows with the Bible. Because it is God’s Word, it would be correct in whatever matters it addresses. Furthermore, if the Bible is not truthful in physical matters, then it cannot be trusted when it addresses spiritual matters. Truly, the concept of partial inspiration impugns the integrity and nature of God, conflicts with the evidences for inspiration, and should be rejected as heresy. People rightly believe that an actual discrepancy within the Bible would discredit the authenticity of Scripture, for the simple reason that those people have been created by God to function rationally! They recognize that, by definition, truth must be consistent with itself. The very nature of truth is such that it contains no contradictions or errors. If God is capable of communicating His truth to human beings, it is both unthinkable and logically implausible that He could not or would not do so with complete consistency and certainty. Infallibility without inerrancy cannot be sustained without logical contradiction. How sad that the attempt to compromise the integrity of the sacred text is altogether unnecessary, in view of the fact that no charge of discrepancy against the Bible has ever been sustained. Plausible explanations exist if the individual will study and apply himself to an honest, thorough evaluation of the available evidence. God has provided sufficient evidence to allow an honest person to arrive at the truth and to know His will (John 6:45; 7:17; 8:32). Those who are willing to compromise, and who back away from a devotion to verbal inspiration and inerrancy of Scripture, demonstrate a lack of faith in both God and His Word. Geisler, Norman and Thomas Howe (1992), When Critics Ask (Wheaton, IL: Victor). Marsden, George (1987), Reforming Fundamentalism: Fuller Seminary and the New Evangelicalism (Grand Rapids, MI: Eerdmans). Packer, J.I. (1958), “Fundamentalism” and the Word of God (Grand Rapids, MI: Eerdmans). Preus, Robert (1984), “Notes on the Inerrancy of Scripture,” Evangelicals and Inerrancy, ed. Ronald Youngblood (Nashville, TN: Thomas Nelson). Shelly, Rubel (1990), Prepare to Answer (Grand Rapids, MI: Baker). Warfield, Benjamin (1970 reprint), The Inspiration and Authority of the Bible (Philadelphia, PA: Presbyterian & Reformed).